A viral photo that gain popularity in social media network after a photographer uploaded a photo of a brown weasel riding at the back of the green woodpecker. In Hornchurch Country Park in east London, photographer Martin Le-May, captures a weasel hitching a ride on the back of a woodpecker. Photographer told the story on why the weasel is on the back of the woodpecker, he explain, actually is not like the weasel is actually stuck his thumb out and ask for a ride. The weasel is trying to kill the bird. It is a sunny afternoon with occasional clouds, my wife and I had gone for a walk, hope to see a woodpecker that my wife haven't seen it before. As we heard and see a flash of green and I hurried to point the camera towards the bird. Suddenly the birds flew towards us, as we noticed that a small mammal is itching the back of the bird. The bird flew down near in front of us, as the bird struggle for his life to get rid off the weasel at the back of the bird. Due to our presence for about 25 meters away, from the struggling bird and weasel, we had might momentarily distract the weasel and the woodpecker take the chance and seized opportunity to flew away from the weasel through some bushes , quickly the bird gather itself and it flew up the top of the tree’s and away from our sight. The weasel had just disappeared in the long grass, and hungry . Social media user, add flavor on the viral photo as they also add additional character on the weasel and woodpecker as they Photoshop the viral photo and add additional character riding on it. Like Madonna, Miley Cyrus , The Rock and other famous star riding on top of the woodpecker. 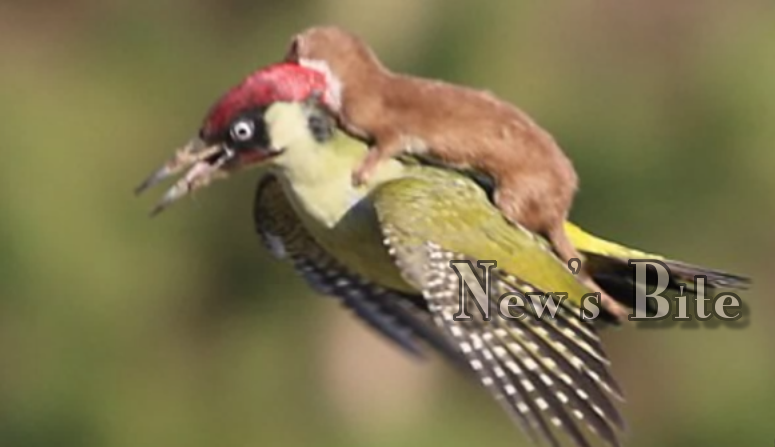 No Comment to " Viral Photo: Woodpecker And A Weasel Takes A Ride Of Their Life "